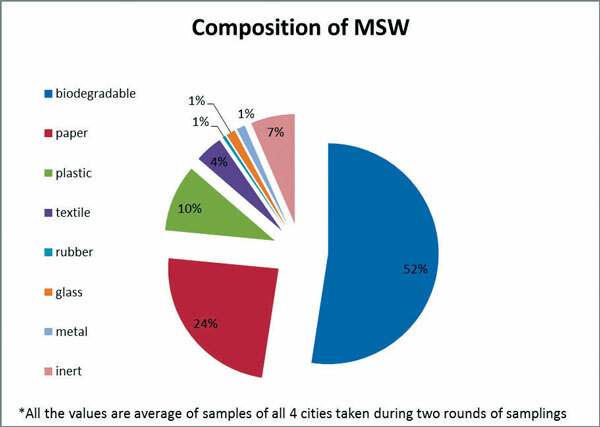 Composition of Municipal Solid waste in Himachal Pradesh. An accepted fact that our efforts of managing Solid waste are failing mainly for the want of segregation at the source and so are they in the State of Himachal Pradesh. Not a difficult task at all but seems impossible. It is so because the community participation is absolutely lacking and currently community and municipality/government are like two opposite poles of the globe or two lines of the railway track that never meet. Municipality has become the sole agency to manage the waste and community has become the pressure group to just assume the role of criticizing the Municipal Governance failure in the field of Municipal Solid waste management (MSWM). As per data, of the total waste collected in Himachal Pradesh nearly 52% is bio degradable. Which if segregated can go back into nature without the need of management. The balance 48% can then be recycled and put to use for agriculture/horticulture, bio gas and others such purposes. But perhaps only once segregation of the waste becomes possible. Where everything gets wrong is that in the current whatever garbage is being collected is mostly in un- segregated form. This is where our efforts on MSWM are getting back-seated. As mostly it is being presumed that waste shall be collected from the entire town and then segregated at the dumping site. To later only realise that it is an impossible task especially when the waste is in bulk. Though very late, but in 2015 the hill state conducted a feasibility study on the subject. By February 2017 they proposed to initiate an action plan for the same. As per the provisions of SWM Rules, 2016, it had been made mandatory for every waste generator to segregate and store the waste generated by them in three separate streams namely biodegradable, nondegradable and domestic hazardous waste and handover segregated waste to authorized waste pickers/collectors only. Through the move, segregation of waste at source was to be implemented in all the ULBs and the provisions were to be incorporated in the door to door garbage collection (D2DGC) Bye-laws as well. Yet as of date the plan on ground is differently staged. As per the state government plan 2017 a period of 24 months was decided to implement segregation of waste at source through ULB’s. The same is to be achieved through extensive campaigns, educating masses about the three streams of waste. But visibly the plan is getting hay wired . As mostly the funds starved ULBs are distributing the segregation bins without supporting it with an aggressive sensitization campaigns. And then to top thereafter this new method of segregation of waste at source is not being monitored in a aggressive manner. In fact to the plight that the multicolored bins distributed to every house hold at a cost by the ULBs were largely converted into water storage baskets. Attributing to reason that some citizens lacked awareness on this subject and others remained knowingly ignorant in dearth of penalties. Non Segregation of solid waste could change the ecology for worst. Understanding the magnitude even a penalty clause can be worked out for non segregation of waste at source. Across nations penalties are levied on waste generators who dispose without segregation. But such move would require tremendous will and could only invite protests. Moreover in the era where visions are myopically fixed to only vote bank politics, scope for brave ecology friendly decisions/ demands are minimal. The current waste management units (majority) in the state still rely on manual segregation at dumping site, which too is against the fancies of Human rights. Listing some achievement an MOU has been signed with NTPC Koldam who are collecting all waste from their township, segregating the same and then are transporting it to ACC Barmana to be used as plastic fuel. More similar MOUs and other smaller projects though are being implemented but to no evident results at grass root level yet. As yet every year rains witness choked Nallas, mucked water sources and piles of solid waste. In a setup like of our nation there is a need to formalize the sorting system. This should be done either at source or develop a centralized sorting facility to minimize recyclable materials reaching a waste processing facility or a landfill. Otherwise all the efforts and money getting poured into processing plants and other waste management campaigns shall go as waste without achieving the goal of zero waste. Thus only adding more Gazipurs in the list and who know the ones developing now maybe even higher than the Qutub Minar!